Mkts rebound on value buying. After a mega carnage which wiped out Rs 7 lakh crore market wealth on Monday, stock markets made a smart recovery on Tuesday, driven by value-buying in banking, realty and metals counters. Mumbai: After a mega carnage which wiped out Rs 7 lakh crore market wealth on Monday, stock markets made a smart recovery on Tuesday, driven by value-buying in banking, realty and metals counters. Rupee recovery, the reports about the proposal by the government to convene a special session of parliament for GST Bill and China’s decision to cut interest rates are among the factors that have left positive impact on the bourses. 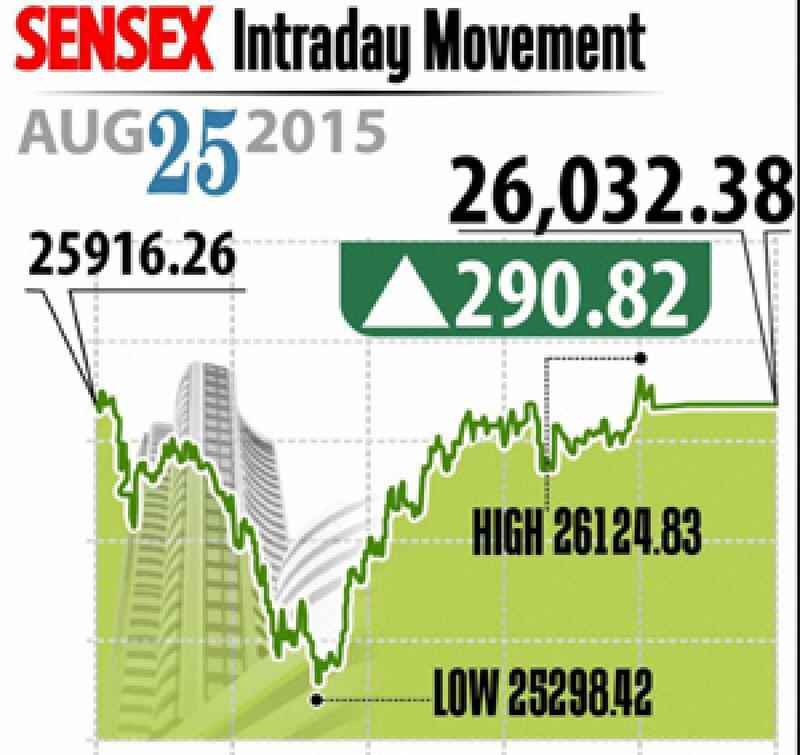 The benchmark BSE Sensex rose by 290.82 points to end the day at 26,032.38. The premier index opened in the positive zone and rallied to touch day’s high of 26,124.83 briefly, but slipped into the negative zone as selling pressure re-emerged and fell to a low of 25,298.42. However, towards the middle of the day, it staged another comeback to close the session 290.82 points or 1.13 per cent higher at 26,032.38. In the previous three sessions, the index lost 2,190.08, including Monday’s big fall of 1.624.51 points. Trading in a wide range of 826.35 points during the day, the index managed to reclaim the 26,000-level after falling to its lowest since August 8, 2014, clocked in previous trading. The NSE Nifty jumped by 71.70 points or 0.92 per cent to close at 7,880.70. Intra-day, it reclaimed the 7,900 mark to touch a high of 7,925.40 and a low of 7,667.25. Analysts said sentiments got a boost after the government said, to pass key reform bills, including GST, it might reconvene the monsoon session. Moreover, recovery in rupee, which sharply appreciated by 76 paise to 65.89 intra-day against the dollar also supported sentiment. Market volatility was also high in view of August month expiry in the derivatives segment on Thursday. Among 30-Sensex stocks, 22 ended with gains led by Vedanta, Tata Motors, Coal India, ICICI Bank, Axis Bank, NTPC, Tata Steel, GAIL, SBI, RIL, BHEL, Dr Reddy’s and Hindalco. Barring IT, all the BSE sectoral indices notched up gains led by realty, metal, oil& gas, PSU and banking. Retail investors pumped money into mid-cap and small-cap shares with respective indices rising up to 1.99 per cent. Globally, most Asian bourses closed mixed with Chinese equities sliding by 7.63 per cent.